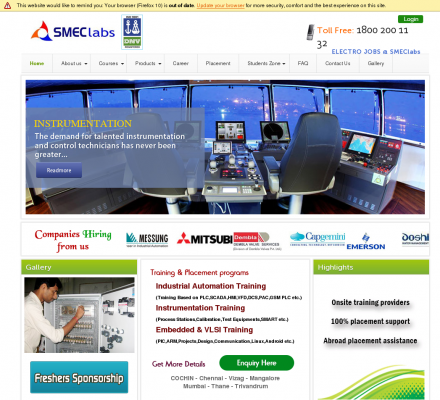 SMEClabs, the research, development and training wing of SMEC Automation has catered to the needs of more than 4000 students over the years, all of whom are presently employed in prestigious companies in India and abroad. SMEC Automation is the Authorized System Integrator for Schneider Electric, France, the systems house of GE fanuc and the Authorized training centre for Proficy iFix. SMEClabs is the first automation training provider in the world to be certified with ISO 9001: 2008 standards of quality. We offer certification programs for a variety of courses and modules which impart real time training to students looking for practical industrial exposure. All programs conform to stringent quality and know-how assessment from DNV (Det Norske Veritas) which is the world authority on quality management and training centers related to the instrumentation/ automation sector. On successful completion of the course, the candidate receives our certificate which is attested by DNV, which inherently promotes him to a qualified and well trained employee, giving him the leverage and respect in all his future pursuits. Also we provides guidance to students for their academic projects at our facility. Description: India's leading automation training institute. Job oriented training in PLC, SCADA, VFD, HMI, PAC, DCS and field instruments.